At my last dentist appointment in January, I talked with the dentist, Dr. Evans, and hygienist about the possibility of bringing Hannah in sometime. We decided to set an appointment for July and just see what she was comfortable with. They said that 2-yr-olds typically ride up and down in the chair and sometimes will cooperate and open their mouths. This isn’t a big deal since regular dental visits aren’t recommended until age four. So we took Hannah in; she got to see Brett get his teeth cleaned. Then it was her turn. She did awesome! Sitting on Brett’s lap, she let the hygienist do a complete cleaning (with chocolate toothpaste!) and got an exam with Dr. Evans. They said she was one of the best-behaved 2-yr-olds they’d ever had. They said her teeth look great, and she thought the whole thing was very exciting. Next appointment in six months – our big girl! We get our CSA veggie boxes every other week, but I haven’t been keeping up with the regular updates. So here are some iPhone pics of some yummy things I’ve been making lately with our local bounty. 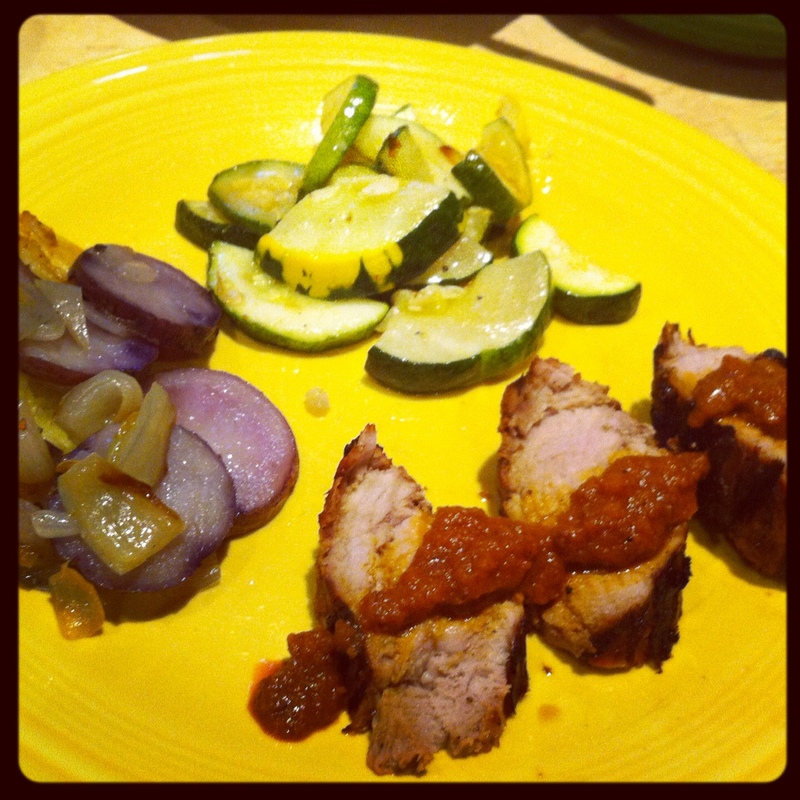 Grilling night – I marinaded a pork tenderloin in some barbecue sauce we got from a local guy at the farmer’s market, and we put extra sauce over the top. I put purple peppers, onions and purple potatoes in a foil wrap for the grill. We ran out of grilltop space, so I roasted the mixed squash in the oven. CSA ingredients: peppers, onions, potatoes, squash. I think the purple potatoes are especially fun. 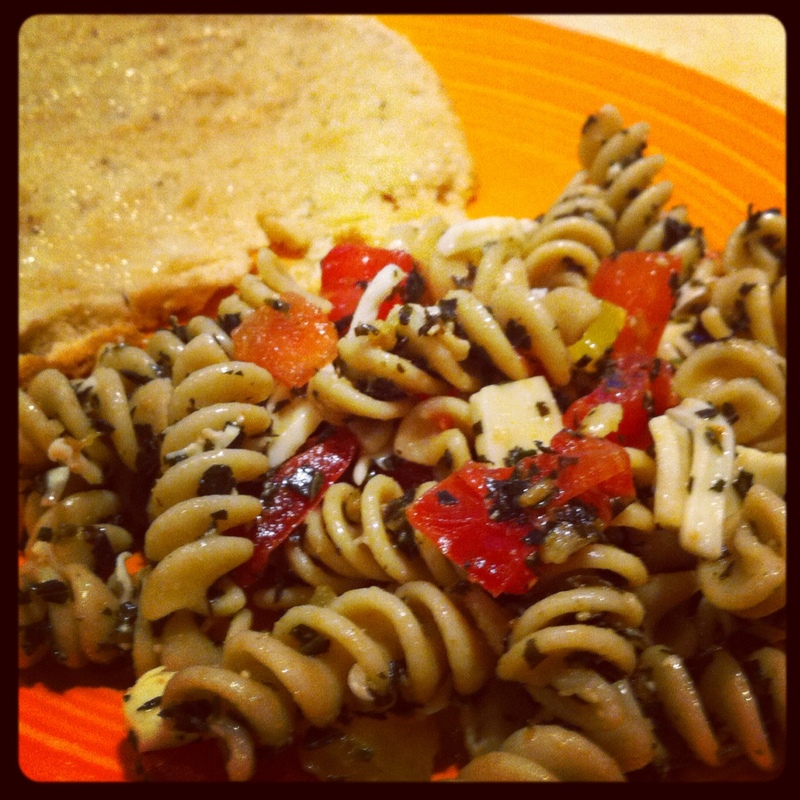 This was simple and tasty – pasta salad with whole wheat rotini, heirloom tomatoes, cheese and pesto. I also finally got something to work out with the bread machine I’m experimenting with, so the edible bread was a big victory. CSA ingredients: tomatoes, basil. Pickled okra – No picture for this. I feel like there are only so many things you can do with okra. Like beets, they seem to have limited possibilities, so several weeks of them tend to stretch my creativity. But I adapted this recipe to what I had on hand with tasty results. CSA ingredients: okra, hot peppers. 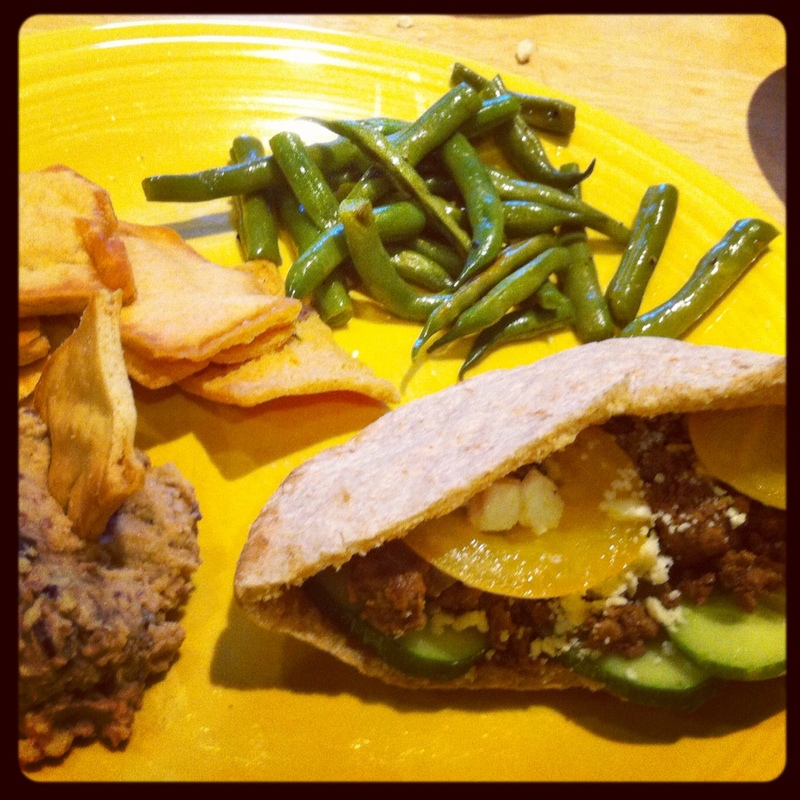 Greek pitas – We love gyros, and I found an easy homemade substitute. I just season ground beef with cumin, garlic and oregano for a similar flavor. We put it in a pita with tomatoes, cucumbers and onions and added feta. On the side, I made hummus with kalamata olives to go with pita chips, and I sauteed green beans. CSA ingredients: tomatoes, cucumbers, onions, green beans. Greek nachos – To use up some of the leftovers from the pitas, I made up “nachos” for a fun appetizer for another meal. 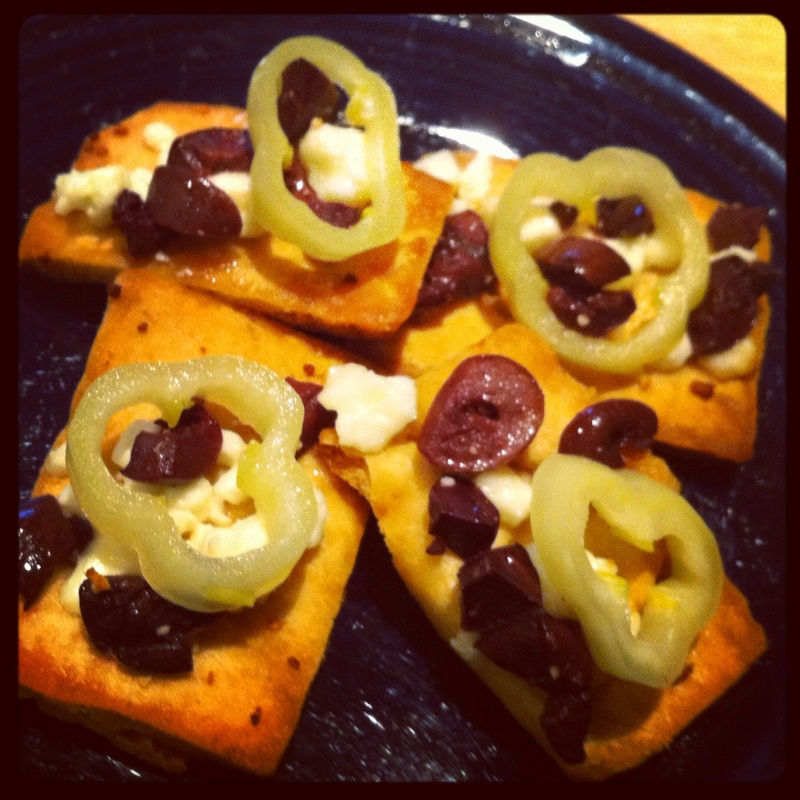 I laid out pita chips and covered them with feta and kalamata olives. After they were slightly baked, I topped them with some pickled banana peppers. Yum! Hannah really liked these. CSA ingredient: banana peppers. Salsa – I don’t have a picture for this either, but one week we had huge portion of tomatoes. This was a little difficult initially because Brett does not like tomatoes. Then my friend Meghan suggested salsa – duh! I can’t believe I missed the obvious with my fridge full of tomatoes, peppers and onions. I made a huge batch, and after we’d eaten it fresh for several meals, I cooked the rest and bagged it for the freezer. This was my first attempt at freezing homemade salsa, so I hope it turns out well. 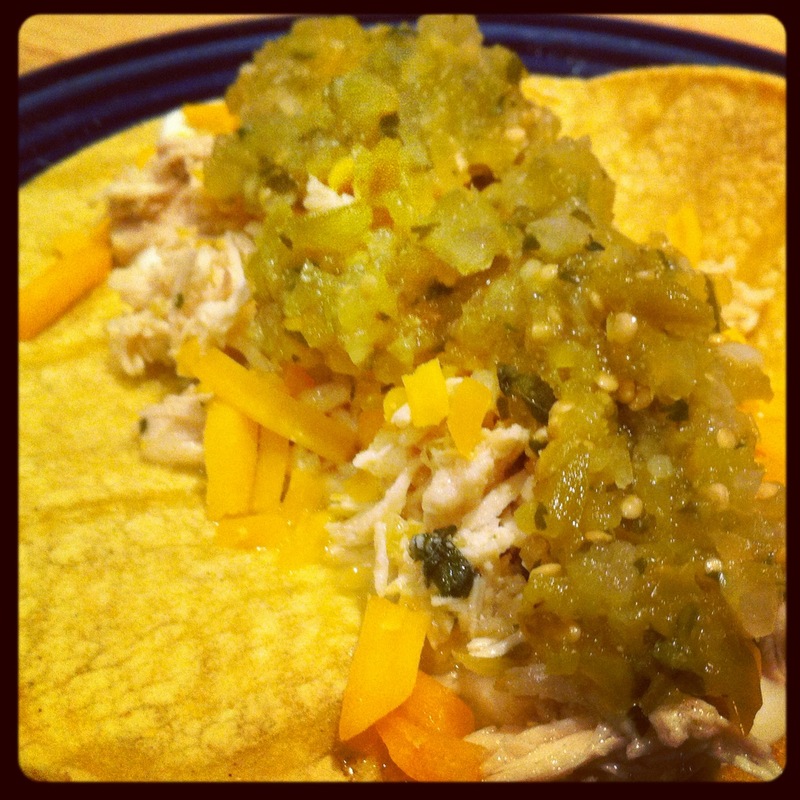 Chicken tacos with verde salsa – I made my favorite shredded chicken in the slow cooker. For the roasted verde salsa, I borrowed this recipe from Tyler Florence. Hannah is literally inches away from me for most of my kitchen adventures, and I give her as many projects as possible. I found that husking tomatillos is an awesome job for a 2-year-old. It was very easy but gave her quite a sense of accomplishment. We assembled the tacos on corn tortillas with sour cream, chicken, cheese and verde salsa. This is one of Brett’s new favorites. CSA ingredients: tomatillos, onions. We have a neighbor who has a small “farm” in his backyard and also manages a larger farm outside of town. They were experiencing a plethora of figs, so this generous neighbor came over with a basket. This was a totally new ingredient for me! And, I’m not gonna lie, my only experience eating figs so far in my life was Fig Newtons which probably doesn’t really count. 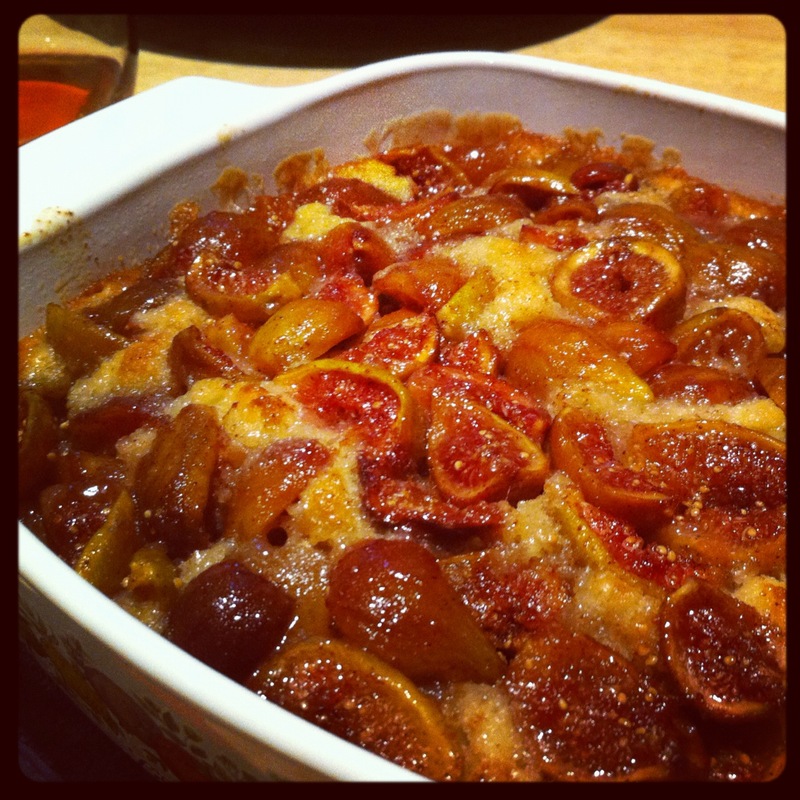 With the help of Google, I found a website called Israeli Kitchen with a recipe for Fresh Fig Cobbler. I made a half batch, and it was gone quickly. It would probably be amazing with ice cream, but we didn’t have any on hand. What have you made lately with your local produce? Imagine a trip to the grocery store and there are no clamshells of arugula, no brown rice, no soy milk, no reduced fat products, no high fiber pastas, no microwavable bags of veggies, no whole wheat tortillas or English muffins, no fresh fish and no organic products at all. That’s just the tip of the iceberg (which, by the way, was generally the only kind of lettuce available). Don’t feel like you went back to 1850, you simply returned to the early 1980s. For those of us who wanted to venture into the world of healthier eating, we had to seek out unusual sources and create our own products. Finding whole grains in Lawrence, KS meant a trip to the Community Mercantile (known locally as the Merc). Back then it was a cramped and dark little establishment, run by creepy hippie types with debatable standards of cleanliness. If you really wanted that brown rice or whole wheat flour, you just had to get past the weirdness of the place. Finding recipes meant searching out books like More With Less, Laurel’s Kitchen, and various Jane Brody cookbooks. These books unlocked the secrets of a world of whole grains, beans, granola, scratch cooking and new approaches to vegetables. If I wanted my children to have applesauce that didn’t contain sugar, then I needed to make it myself. If I wanted my family to eat whole grain pancakes, tortillas or English muffins, then I needed to make them. If I wanted lower sugar strawberry jam with no artificial colors, then I needed to make it. Plain nonfat yogurt necessitated the purchase of a yogurt maker. The intrepid adventurers seemed to find each other, and we renegades banded together and shared what we were learning. Some people accused us of living in the past, but we were convinced that we were moving into the future. The events of the last 30 years would prove us right. Bookshelves and the internet are now filled with healthful recipes. Brown rice is sold on the same shelf as white rice – it isn’t even necessarily relegated to the “health food” section of the grocery store! Getting enough fiber is now a mainstream subject and not a topic that is discussed only in private. The Merc is now a beautiful, large, clean, well-lit grocery store where anyone can shop comfortably. Organic meats, fruit and veggies are sold everywhere. 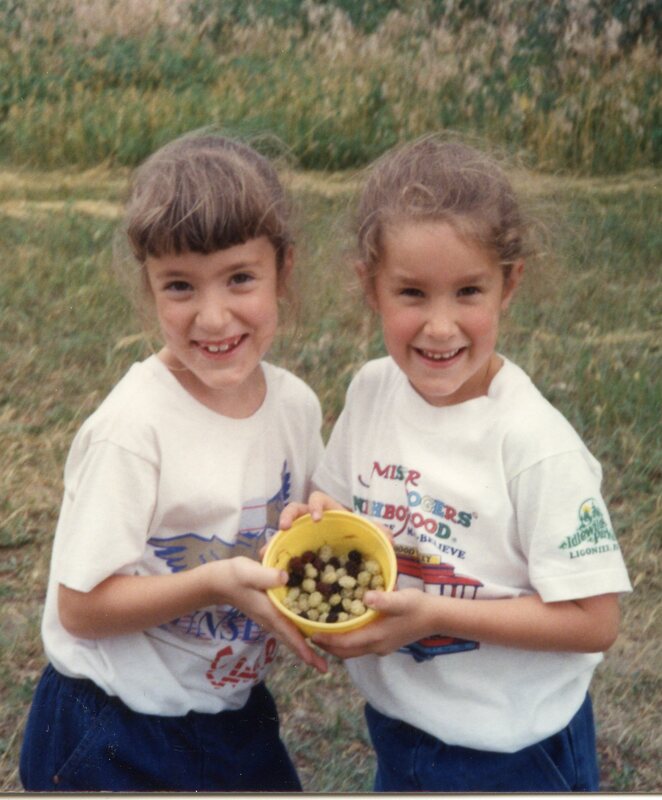 When I see foodie friends from the 80s, we all laugh and wonder where we found the TIME to make all of those things! Most of us had small children, and several of the moms worked part time. Our conclusion is that we were so committed to what we were doing, that not doing it simply wasn’t an option. If I had more energy, I’d make these into separate posts with fun pics. But you get bullet points instead. – Bye to Bingley – In an attempt to simplify our life in preparation for family growth, we have decided to re-home the dogs. My parents graciously offered to welcome Bingley as a friend for their dog Rocky, so we took him up with us on our Kansas trip. We are getting good reports about the adventures of Bingley and Rocky. It was sad to say goodbye, but we know he is happy with a huge yard and a friend. We are still looking for a new home for Leia; let us know if you are interested. – New wheels – We loved our Honda Pilot, but the automatic sliding doors of the minivan lured us to the official family vehicle. 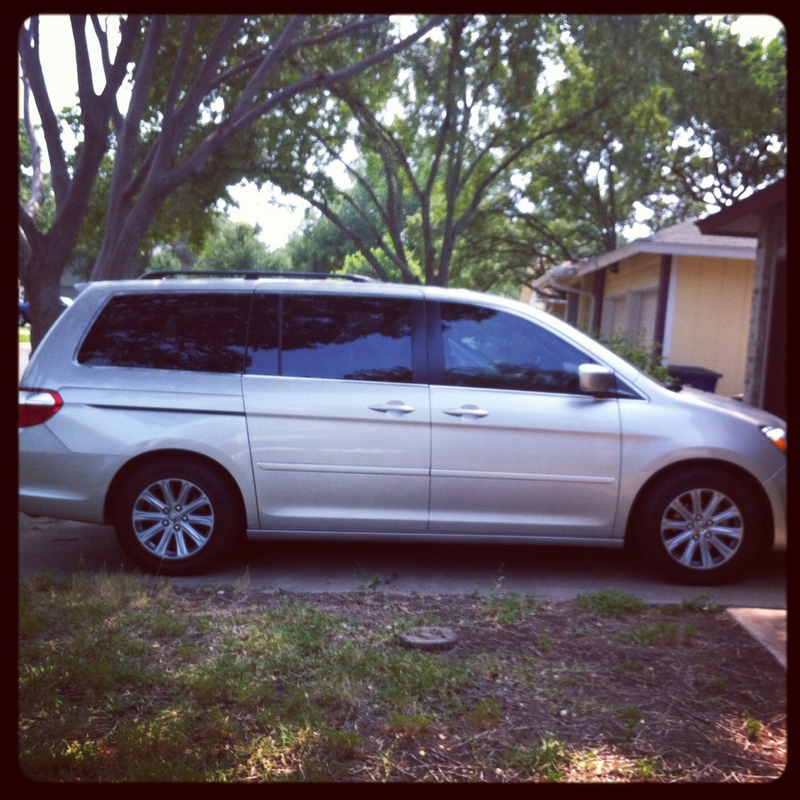 It is a 2007 Honda Odyssey, and we are in love! Good thing since I’ll probably be driving a minivan for the next 20 years or so. – Baby update – I’m now 26 weeks along, finishing up the second trimester. The pregnancy tracker iPhone app says that my baby this week is the size of a cucumber, 15 inches long and 2.2 lbs. My mom has pulled some mammoth produce from her garden, but I’m not sure I’ve ever seen a 15 inch, 2 pound cucumber. Anyway, baby girl remains quite active, and I’m feeling pretty good, just tired. – Big girl bed – The crib has been moved into the guest room which is the new nursery, and Hannah has a big girl bed. We got a set of bunk beds from Ikea but only assembled the frame and bottom bed. She is very proud of her new bed, but bedtimes have been rough as she does not enjoy actually staying in her bed. – Ballet class – I am still taking the adult ballet class I joined in January. The classes continue through the summer, and I am doing as much as I can with my growing baby bump. My teacher says my grand battements are still just as high as the 20-year-olds in my class, woohoo! We’ll see how the third trimester goes. – Weekend away – Brett and I will be attending a “Food and Family” conference in San Antonio in a couple weeks. We are excited about the topics (nutrition, meal planning on a budget, sustainable farming, hospitality, Biblical feasting, etc) and the chance to hang out on the Riverwalk for a few days. I’ll definitely be doing a big recap when we return. – Down with diapers – I would now consider Hannah to be potty-trained, yay! I’m not one of those moms to include all the details, but everyone in the house is very excited to only deal with diapers for sleeping. What a big girl! Now I’m going to enjoy a 3-month break from regular diaper changes. And to answer any possible questions: No, we don’t have a name for the baby yet, and even if we did we wouldn’t tell. Yes, it is ridiculously hot. Yes, I will post pictures of the new bedroom arrangements when they are finished. No, we haven’t watched “Downton Abbey” yet, but it’s on our to-do list.